The "REIS-D" unmanned aircraft is used to carry out a complex reconnaissance of the terrain for military as well as for peaceful purposes. The aircraft can execute: reconnaissance of the zones of concentration of troops and technique; reconnaissance of the engineering-technical constructions and facilities; reconnaissance of the regions of ecological and natural calamities; determination of the places and sizes of forest fires, gas and oil products accidents; reconnaissance of the terrain for other purposes. The aircraft can be used from the areas unprepared from the engineering point of view, at day and night time, on the flat and mountainous country. In the late 1970s, after the arrival of the "Reis" complex, the question arose about its modernization in order to increase its efficiency. A representative office of the Tupolev Design Bureau was invited to the meeting of high officials, where engineers were assigned the task of building a modernized reconnaissance vehicle with the availability of updated technical devices and the possibility of organizing night outings. Before the OKB, the task was set to equip the reconnaissance aircraft with new means and types of reconnaissance equipment that had higher resolution characteristics, the introduction of systems enabling them to conduct reconnaissance operations at night. Requirements were set to improve the flight and tactical data of the reconnaissance aircraft, in particular, on the range of flight. The most important of the requirements put forward was to increase the range of flight. Regarding the ground complex, a requirement was made to reduce the composition of maintenance personnel, to simplify the operation process and to reduce the number of technical support tools. 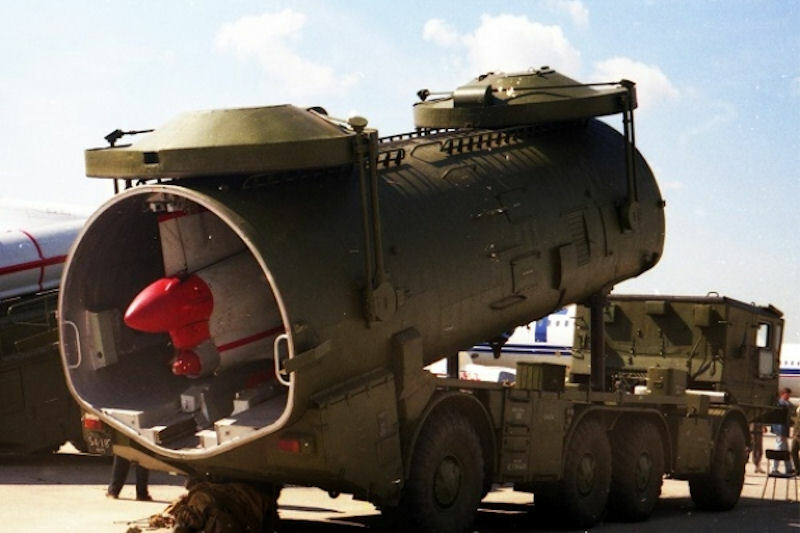 According to the ground forces, it was required to reduce the composition of maintenance personnel, the number of technical facilities and simplify the operation process for the TZM. The Council of Ministers of the USSR issued Decree N 249-76 of March 6, 1981 on the development of a modernized complex VR-ZD "Reis-D". The tactical and technical requirements for the complex were approved by the Customer in February 1983. Until 1987, the Design Bureau was engaged in the design and construction of prototypes of reconnaissance UAV, which received the code "243" ( Tu-243 ) for the OKB . 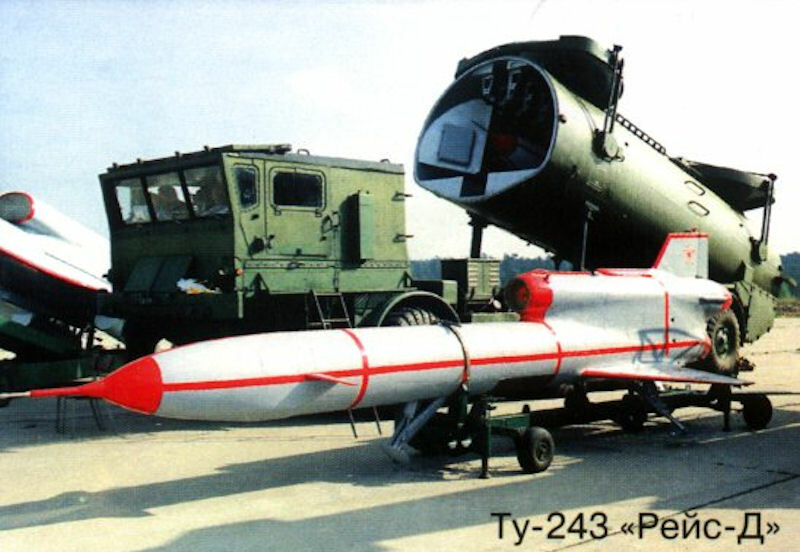 The first flight of an experimental UAV Tu-243 was made in July 1987. By now, the experimental batch of Tu-243 aircraft has passed state tests and the new complex is put into serial production at the Kumertau machine-building plant instead of the "Reis" complex. The works carried out within the framework of the creation of the new unmanned reconnaissance complex "Reis-D" made it possible to increase the efficiency of the complex by more than 2.5 times. Elements of the complex were repeatedly presented at exhibitions in Zhukovsky (MAKS). The upgraded complex is actively offered for export. There is a real possibility of using the complex to solve environmental problems. The design of the UAV airplane Tu-243, as compared to the Tu-143, did not undergo any special changes. 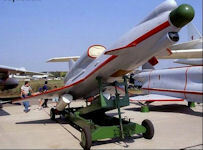 Maintaining the overall aerodynamic layout, aircraft systems, the Tu-143 UAV propulsion system, the developers completely updated the reconnaissance equipment, introduced a new navigation and flight control system, repackaged the deployment of UAV equipment, increased the fuel supply, and so on. The first variant includes the installation of special equipment: a panoramic aerial camera PA-402 (creates a broad picture of what is happening, has a high detail), the television intelligence system "Aist-M" (real-time data transmission), the "Trassa-M" ( way of information transfer). The second variant is slightly different. It also installed PA-402, but the television system was replaced by an infrared reconnaissance system, or "Winter-M". It also transmits information with the help of the "Route-M". In addition to the transmission of information on the UAV Tu-243 installed recording equipment. The reconnaissance range for one sortie is increased quite well. It is 2100 square meters. km. And thanks to the special arrangement of the reconnaissance aircraft, it is possible to place a reconnaissance complex "Sigma-R" on it. It should be noted that to improve the tactical capabilities of UAV and increase the characteristics of the entire complex, the Tu-243 was installed, designed on the universal elemental base NPK-243 (navigation and aerobatic complex). In the case of landing the aircraft in an unplanned location or for a quick operation to search for a UAV, the marker beacon was mounted on it.